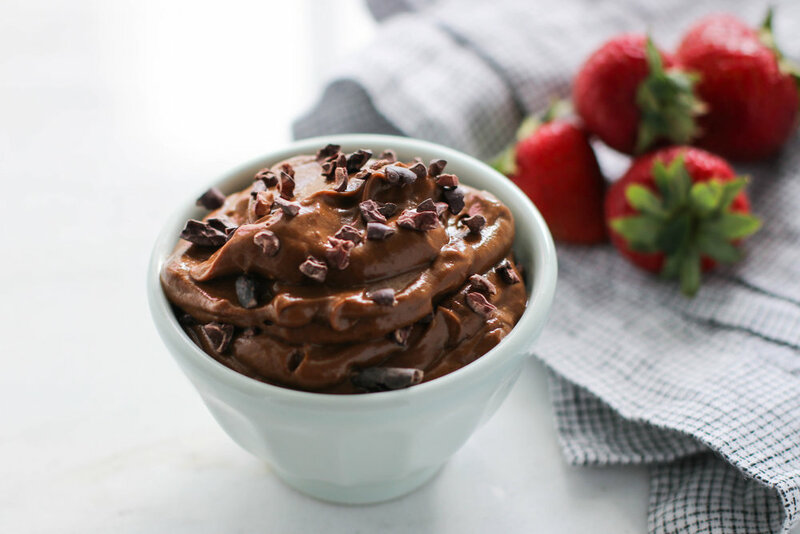 Chocolate Avocado Pudding — Erin Parekh | Live Well, Simply. Did anyone else eat Jell-o pudding cups growing up? My favorite was the dark chocolate and vanilla layered one. It seemed so much fancier than the regular chocolate variety. Well, I didn't make a layered pudding here, but I promise, this pudding is a thousand times better than those foil-topped cups and much healthier too. But avocado you say? Yes, avocado. It makes for such a creamy, dreamy pudding. You can't taste it either - just pure chocolatey goodness. Add avocado flesh + remaining ingredients to a high powered blender or food processor. Blend until smooth and creamy, scraping down the sides as needed. If pudding needs help blending, add a splash more coconut milk. Taste and adjust to your preferences. Add more maple syrup for a sweeter pudding or a bit more cacao powder for a richer chocolate flavor. Chill for at least 30 minutes to thicken. Garnish with cacao nibs and flaked coconut. Note: Leftovers will keep for several days in the fridge, though best within the first day of making.